This false-color image taken by NASA's Mars Exploration Rover Opportunity shows a rock dubbed "Escher" on the southwestern slopes of "Endurance Crater." NASA's Spirit and Opportunity have been exploring Mars about three times as long as originally scheduled. 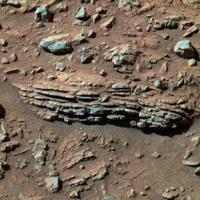 The more they look, the more evidence of past liquid water on Mars these robots discover. Team members reported the new findings at a news briefing today. About six months ago, Opportunity established that its exploration area was wet a long time ago. The area was wet before it dried and eroded into a wide plain. The team's new findings suggest some rocks there may have gotten wet a second time, after an impact excavated a stadium sized crater. Evidence of this exciting possibility has been identified in a flat rock dubbed "Escher" and in some neighboring rocks near the bottom of the crater. 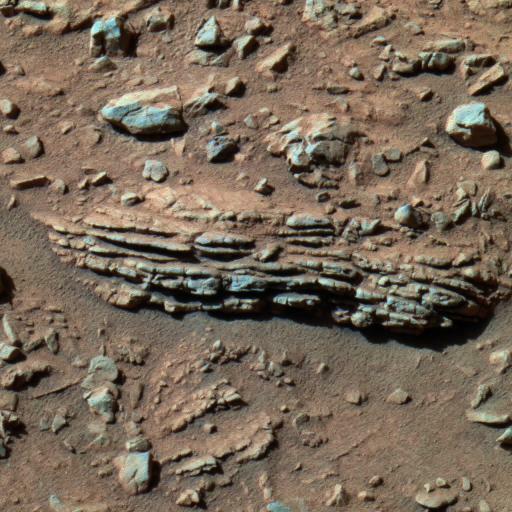 These plate-like rocks bear networks of cracks dividing the surface into patterns of polygons, somewhat similar in appearance to cracked mud after the water has dried up here on Earth. This image, taken by the panoramic camera on NASA's Mars Exploration Rover Spirit during the rover's trek through the "Columbia Hills" at "Gusev Crater," shows the horizontally layered rock dubbed "Tetl." Alternative histories, such as fracturing by the force of the crater-causing impact, or the final desiccation of the original wet environment that formed the rocks, might also explain the polygonal cracks. Rover scientists hope a lumpy boulder nicknamed "Wopmay," Opportunity's next target for inspection, may help narrow the list of possible explanations. "When we saw these polygonal crack patterns, right away we thought of a secondary water event significantly later than the episode that created the rocks," said Dr. John Grotzinger. 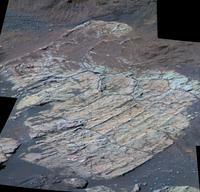 He is a rover-team geologist from the Massachusetts Institute of Technology, Cambridge, Mass. Finding geological evidence about watery periods in Mars' past is the rover project's main goal, because such persistently wet environments may have been hospitable to life. "Did these cracks form after the crater was created? We don't really know yet," Grotzinger said. If they did, one possible source of moisture could be accumulations of frost partially melting during climate changes, as Mars wobbled on its axis of rotation, in cycles of tens of thousands of years. According to Grotzinger, another possibility could be the melting of underground ice or release of underground water in large enough quantity to pool a little lake within the crater. One type of evidence Wopmay could add to the case for wet conditions after the crater formed would be a crust of water-soluble minerals. After examining that rock, the rover team's plans for Opportunity are to get a close look at a tall stack of layers nicknamed "Burns Cliff" from the base of the cliff. The rover will then climb out of the crater and head south to the spacecraft's original heat shield and nearby rugged terrain, where deeper rock layers may be exposed. Halfway around Mars, Spirit is climbing higher into the "Columbia Hills." Spirit drove more than three kilometers (approximately two miles) across a plain to reach them. 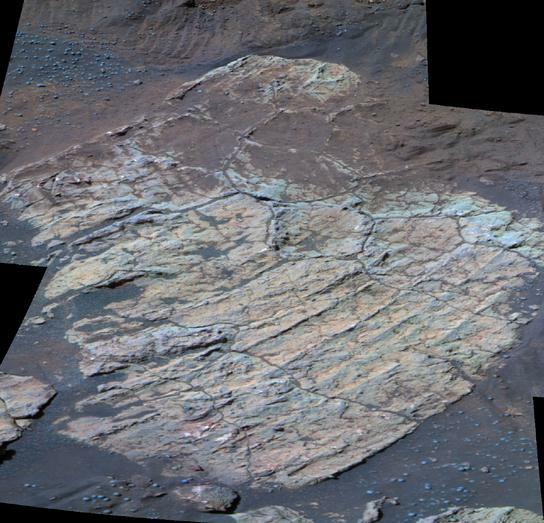 After finding bedrock that had been extensively altered by water, scientists used the rover to look for relatively unchanged rock as a comparison for understanding the area's full range of environmental changes. Instead, even the freshest-looking rocks examined by Spirit in the Columbia Hills have shown signs of pervasive water alteration. "We haven't seen a single unaltered volcanic rock, since we crossed the boundary from the plains into the hills, and I'm beginning to suspect we never will," said Dr. Steve Squyres of Cornell University, Ithaca, N.Y., principal investigator for the science payload on both rovers. "All the rocks in the hills have been altered significantly by water. We're having a wonderful time trying to work out exactly what happened here." More clues to deciphering the environmental history of the hills could lie in layered rock outcrops farther upslope, Spirit's next targets. "Just as we worked our way deeper into the Endurance crater with Opportunity, we'll work our way higher and higher into the hills with Spirit, looking at layered rocks and constructing a plausible geologic history," Squyres said. Jim Erickson, rover project manager at JPL, said, "Both Spirit and Opportunity have only minor problems, and there is really no way of knowing how much longer they will keep operating. However we are optimistic about their conditions, and we have just been given a new lease on life for them, a six-month extended mission that began Oct. 1. The solar power situation is better than expected, but these machines are already well past their design life. While they're healthy, we'll keep them working as hard as possible." JPL, a division of the California Institute of Technology in Pasadena, manages the Mars Exploration Rover project for NASA's Science Mission Directorate, Washington. Images and additional information about the project are available from JPL and Cornell at http://marsrovers.jpl.nasa.gov and http://athena.cornell.edu .